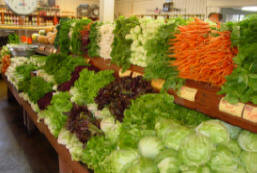 Underwood Family Farms is proud to offer our exceptionally fresh produce to you from our Farm Market in Somis. 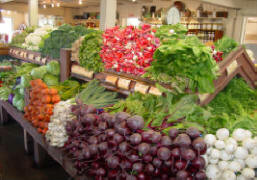 You are invited to come browse through our wide array of "super fresh" fruits and vegetables. There is always someone on hand to answer your produce questions or offer you a taste of our ever-changing specials. The Farm Market also carries many types of superb pickled vegetables, honey, nuts, juices, dried beans, farm fresh eggs, fresh cut flowers, gifts and unique gift baskets. At Harvest time we offer many sizes of pumpkins for you to choose from as well as corn stalks, gourds, squash and many other items to help you decorate for the fall. Our pumpkin patch has a hay pyramid, corn stalk tunnel and many photo opportunities.